Research Triangle Park, NC (Sept. 26, 2018) – In her striped dress and maroon ball cap, Lisa Jo Douglas was waiting at the door of the United Way donation center in Lumberton, ready to give out a thank you, a God bless you and oh-so-many smiles to the volunteers arriving with buses full of hurricane-relief donations from the Triangle. One bus. Two buses. When the third bus pulled past, Douglas says, her eyes filled with tears. 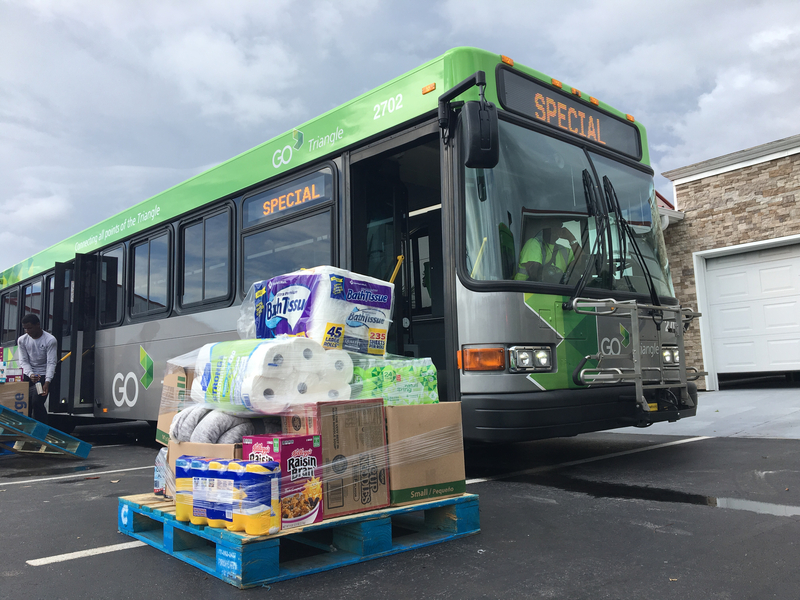 The critically needed goods on those buses and on two others and a van that traveled to Newport on Tuesday were from the Triangle residents who contributed to GoTriangle’s Hurricane Relief Bus drive Thursday. 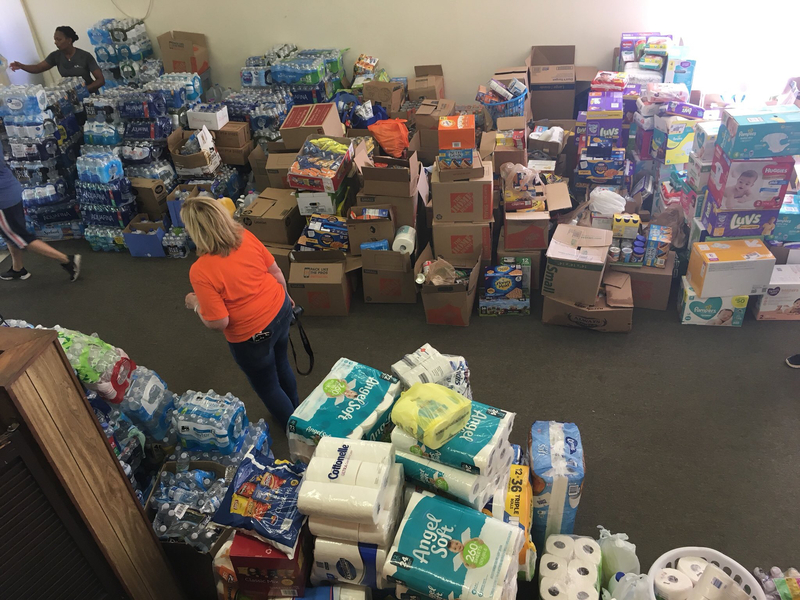 The drive netted more than 60,000 pounds of supplies for our North Carolina neighbors devastated by Hurricane Florence, which made landfall in Wrightsville Beach on Sept. 14 and whose rains continue to plague parts of the state with flooding. In the storm’s aftermath, floodwaters covered much of Newport in Carteret County. Travis Clark, the volunteer Emergency Operations manager at Sanctuary Church of Newport, says it has been heartbreaking to see members of the community start trying to pick up the pieces after losing their homes. The goods he helped GoTriangle and United Way volunteers unload at the church Tuesday are gold to the people who need them. Inside a gathering hall, volunteers set up supplies on tables and allowed families to take the items they needed most. That’s a sentiment echoed by Jonathan Locklear, Lumberton’s landscaping supervisor who, along with several other city employees, helped unload the buses with cases of water, boxes of diapers and bags of cans passing among more than 10 sets of hands in assembly-line fashion. In some ways, the community unity is the silver lining to these dark clouds of destruction, says Joanne Branch, director of the United Way of Robeson County. On Tuesday, Marnita Little stopped by the delivery site in Newport to replenish her supplies. The partially disabled woman, who usually has a nursing aide to help her with things like grocery shopping, spent nearly a week without power in her flooded neighborhood and lost everything in her refrigerator. Knowing they would be helping people like Little is why many of the GoTriangle and GoDurham staff members volunteered to deliver and unload what the Triangle community so graciously gave. Susan Williams says sitting on her couch watching the flooding unfold on TV made her start asking herself what she could do. Vinson Hines Jr., GoTriangle’s assistant director of Transit Operations, is from Goldsboro, also in Eastern North Carolina and another town affected by Hurricane Florence. That volunteer spirit suffusing the site deeply touched Branch and Carolyn Floyd-Robinson, chairman of the board of the United Way of Robeson County. As for Branch, she urged her fellow North Carolinians to remember that no community is immune from this kind of disaster so, when given the chance, we all should reach out to whatever community is in need. When the third bus in Lumberton was empty about an hour and a half after its arrival, volunteer Lisa Jo Douglas was still there. Douglas knows what it’s like to lack every basic necessity her hands were helping unload. Her home and car were destroyed during Hurricane Matthew. As she stepped through the door into sunlight, Douglas had a few more things to give: a hug to anyone within reach of her appreciative arms. The Hurricane Relief Bus drive was part of a larger Here to Help: Hurricane Relief effort orchestrated by WRAL-TV that also included the United Ways of North Carolina and the Greater Triangle, the Food Bank of Central & Eastern North Carolina, GoTriangle, Alliance Health and NC State University. On Saturday, GoTriangle and NC State University will continue their hurricane-relief partnership as the transit agency donates buses and operators for the school’s own donation drive. NCSU has asked football fans to fill the buses at its 12:20 p.m. football game against the University of Virginia that day.